In two weeks I will be heading to Florida for the inaugural MyoMed Ragnar Relay Florida – where runners will start in Clearwater and run across the entire state to Daytona Beach. This is the same race that has become such a beloved tradition in Utah – the MyoMed Ragnar Relay Wasatch Back from Logan to Park City. Ragnar has expanded its races each year and it is exciting to see all of the places where the race courses are popping up across the country. Earlier this year, Ragnar announced their selection of Operation Kids as their official charitable partner. We work to help Ragnar find deserving, efficient charities in the areas in which the races are held that promote youth health and fitness. As always, 100% of what we raise goes directly to the selected charities. This race is an especially exciting one, because elite distance runner Thomas Bassano will be running the entire race … by himself. We have teamed with him to help raise money for the Big Brothers Big Sisters (BBBS) of Pinellas, Hernando and Citrus Counties. With the money received from the MyoMed Ragnar Relay Florida race, Big Brothers Big Sisters will further develop its Sports Buddies program, which provides Big Brothers with the opportunity to participate in monthly sports activities with their “Littles.” Sports Buddies provides opportunities for adults to build friendships and model good sportsmanship, while enabling children to experience and participate in sporting, fitness and recreational events that may be out of reach. Over the last month or so we have had several great calls with BBBS in Florida. I am excited to get to meet Tom, the great BBBS team and to wach all of the crazy runners make the 190-mile trek from “sea to shining sea.” More importantly, I am excited about supporting another worthy cause to help make an impact in children’s lives. 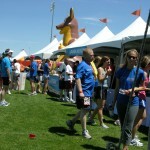 For more information on the Operation Kids/Ragnar Relay partnership, click here. This entry was posted on Thursday, October 30th, 2008 at 12:28 pm	and is filed under Events. You can follow any responses to this entry through the RSS 2.0 feed. You can leave a response, or trackback from your own site.